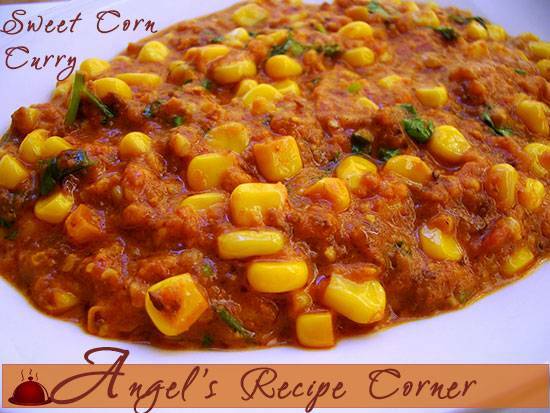 A Gujarati favourite sweetcorn in a spicy rich tomato creamy ﻿sauce. In a fairly large pot, heat up the oil on a medium heat, once hot sprinkle in the cumin seeds and allow to crackle for 20 seconds. Add the onions, garlic, ginger, crushed chillies and saute until light brown. Sprinkle in the coarsely grounded red peanuts and stir fry for 2-3 minutes. Pour in the blended tomatoes, sweetcorn and the also the dried spices, stir well and allow to simmer for 30 minutes with a lid on, stirring occasionally. Finally pour in the single cream, sprinkle in the coriander, stir and cook for a further 10 minutes before serving hot, goes well with naan bread.